This Bianchi glove pouch holds two pair latex gloves in separate pockets. Slim and compact on the duty belt. VELCRO® closure to help protect gloves. 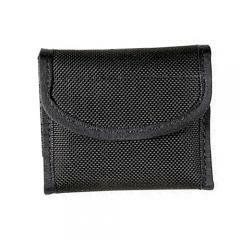 Ballistic weave exterior with nylon pack cloth lining. Slides on to belt up to 2.25". Does the job. I put a pair of latex gloves and decontaminating wipes in it. Just what my expectations were.